No one, whether shepherd or wise man, can approach God here below except by kneeling before the manger at Bethlehem and adoring Him hidden in the weakness of a new-born child. The Solemnity of the Immaculate Conception of the Blessed Virgin Mary is celebrated each year on December 8 and is a Holy Day of Obligation. The following Masses will be held in the church. In addition to our usual offering of the Sacrament of Reconciliation on Saturdays from 3:00-3:45 PM, there will be two additional opportunities during the season of Advent. Several priests will be available on each night. Blessing before a Christmas Stable by Father Peter John Cameron, o.p. Lord Jesus, as I kneel before your manger in adoration, let my first Christmas word be: thank you. Thank you, Gift of the Father, for coming to save me from my sins. Without you I do not know even how to be human. The characteristics of your human body express the divine Person of God’s Son. And in that wondrous expression, Lord, you reveal me to myself. Thank you for that saving revelation in your sacred humanity. As the Christmas liturgy proclaims, in Christ we experience “the holy exchange that restores our life.” Thank you for coming as one like myself to save me from myself. You come as a baby because babies are irresistible and adorable. You come as a baby because you want our first impression of God Incarnate to be that of one who does not judge. How I long to be united with you in every way. May I never be attracted to the allurements and charms of the world. May I love you always, at every moment, with all my heart, soul, mind, and strength. May the ­tenderness, the dependency, and the mercy that you reveal in your infancy become the hallmarks of my life. Newborn Savior, the very silence of your Incarnation proclaims that the answer to the misery, the strife, and the meaninglessness we often experience in life cannot be found within us. You alone are the Answer. As I kneel before you, ­eternal King, I surrender to you all my selfishness, self-absorption, self-indulgence, self-righteousness, self-assertion, and self-exaltation. Even as I adore you on this night of your Birth, rid me of the nagging desire to be adored. Word become flesh, you make your dwelling among us. Yet you do not live your life for yourself, but for us. And you enable us to live in you all that you yourself lived. Help me to embrace this truth with all my mind and heart. Come and live your life in me. Empty me of my willfulness, my petulance, my hardness, my cynicism, my contemptuousness. Fill me with your truth, your strength, your fortitude, your purity, your gentleness, your generosity, your wisdom, your heart, and your grace. O Emmanuel, may the assurance of your unfailing Presence be for me the source of unending peace. May I never fear my weakness, my inadequacy, or my imperfection. Rather, as I gaze with faith, hope, and love upon your incarnate littleness, may I love my own littleness, for God is with us. Endow my life with a holy wonder that leads me ever more deeply into the Mystery of Redemption and the meaning of my vocation and destiny. 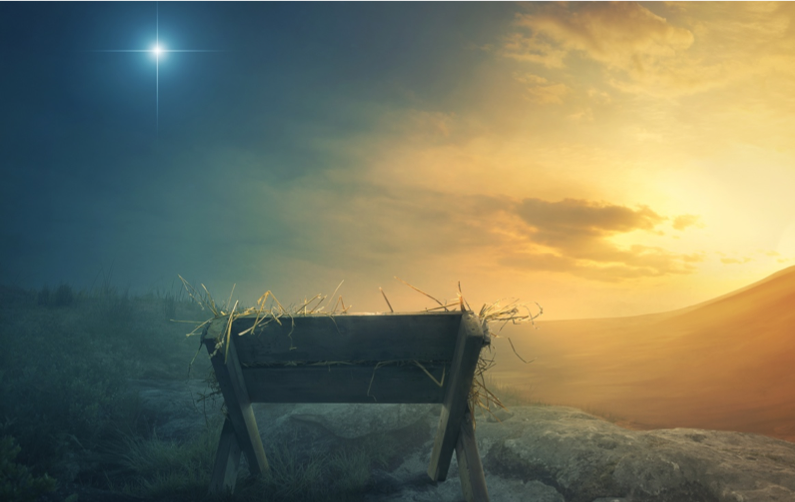 Longed-for Messiah, your servant Saint Leo the Great well wrote that in the very act of reverencing the Birth of our Savior, we are also celebrating our own new birth. From this night on may my life be a dedicated life of faith marked by holy reliance, receptivity, and resoluteness. May I make of my life a total gift of self. May my humble worship of your Nativity manifest how much I seek the Father’s kingship and his way of holiness. The beauty of your holy face bears the promise that your Father will provide for us in all things. This Christmas I renew my trust in God’s goodness, compassion, and providence. May your Presence, Prince of Peace, bless the world with peace, the poor with care and prosperity, the despairing with hope and confidence, the grieving with comfort and gladness, the oppressed with freedom and deliverance, the suffering with solace and relief. Loving Jesus, you are the only real joy of every human heart. I place my trust in you. Oh, divine Fruit of Mary’s womb, may I love you in union with the holy Mother of God. May my life be filled with the obedience of Saint Joseph and the missionary fervor of the shepherds so that the witness of my life may shine like the star that leads the Magi to your manger. I ask all this with great confidence in your Holy Name. Amen.